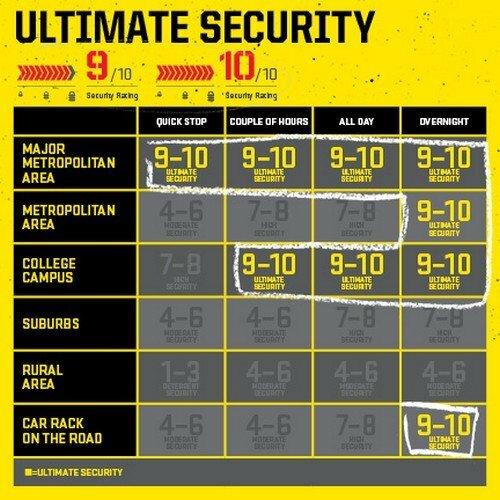 What Are The Most Secure Bike Locks To Secure Your Bike in 2019? Have you ever experienced the heart-sinking feeling of coming back to your bike after locking it up, to find it is not where you left it? Sadly, even if you leave your bicycle unattended for a few minutes in this world you are leaving yourself open to the common practice of bicycle theft. These best bike locks can prevent that. Thieves often steal your bike, repaint it, and call it their own. Even if you file a theft report, very few report ever finding their bike. This can be particularly upsetting if you have spent a few hundred to a few thousand dollars on a bike that you love. The best protection against theft is to purchase one of the best bike locks that you can find. Even if you spend a good amount of money on a lock, it is really worth it when you consider what you are protecting- your bike. In this article, we will be looking into bike lock reviews for a number of different options such lightweight bike locks, combination locks, and gold standard locks plus much more. 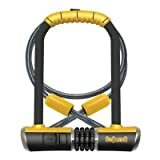 The first on our list of bike lock reviews is this innovative model, which combines a headlight, taillight, and sturdy bike lock all in a single convenient package. The first thing to mention is the design, which is very sleek. The lock comes apart into two pieces- the first is a front clamp that can be mounted as a headlight and the second is the back clamp for the taillight. You fasten the two clamps together to form the actual lock. 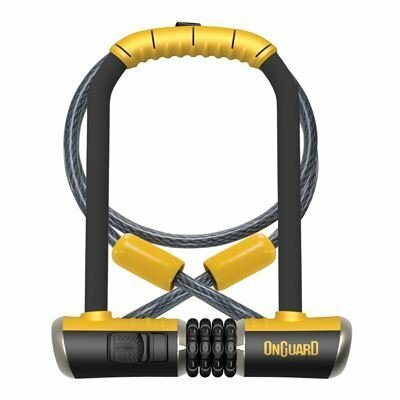 The first on our list of bike lock reviews is this innovative model, which combines a headlight, taillight, and sturdy bike lock all in a single convenient package. The first thing to mention is the design, which is very sleek. The great thing is that it works very simply. You do not need any tools to clamp it onto the front and rear of your bike. Additionally, the key cannot be removed until the clamp has been properly fastened. This prevents you from walking away without having your bike locked up properly. The major downside of the design is that the lock itself is rather short. While it is wide enough to accommodate poles and bike racks that some types of locks cannot, you must have your bike extremely close to whatever you are locking it to. This can be a problem in some areas and is particularly troublesome for a lot of bike locks. An advantage of this lock is that the headlight is very bright, with an output of 300 lumens. The batteries are also quite easy to replace. The taillight is not nearly as bright as the headlight, but it does come with a flashing emergency light function. The final advantage to mention is that the lock clamps right onto your bike, so you don’t ever have to worry about carrying it. This Faghettaboudit U-Lock makes our list of the best bike locks for NYC. Its price/quality ratio is excellent and is perfect for high-crime areas. The design of this contender for the best bike locks is amazing. In addition to being so durable that it can be used in high-crime areas such as New York City, it is incredibly lightweight. This lightweight bike lock weighs just over 1 pound, making it the lightest on our list. This bike lock also has very small dimensions. The great thing about this is that it prevents thieves from using car jacks and levers to break it with sheer force. Unfortunately, this also means that you may struggle to attach it to thicker poles and bike racks. In addition to offering protection from breakage by force, it features shackle locks at both ends. This means that a thief would have to saw through both sides to remove the lock from your bike. The only thing that it may fall prey to is being frozen, or heavy duty power saws or angle grinders. Even with a power tool, however, it would require a lot of time and a lot of sawing to get through this lock. Another advantage is that the Kryptonite company includes three keys- one of them with a LED light bulb for easy use in the dark. Additionally, if you register the product online, you can get replacement keys if you somehow manage to lose all three. Even though you may already be sold on this heavy duty lock, there are a few things to consider. The first is the price. It is one of the more expensive choices on our list, however, it is worth it if you have an expensive bicycle. Another slight downside is the lack of a mounting bracket. There is not one included, and there is also no bracket designed specifically for this lock. Something else to consider is that this particular lock gets rather stiff when wet. This can make it hard to unlock. Fortunately, a little bit of grease can easily fix this. It also prevents water from getting inside during the next rainy season. The final thing that is quite disappointing regards the company itself, and not the lock. Kryptonite does offer a protection policy up to $4,500 if your bike is stolen, but it is quite difficult to meet the requirements. If you read the fine print, they do not even pay for the bike. Instead, they pay the premium of your insurance policy, meaning that you must ensure your bike with homeowners or another type of insurance first. You also have to send back the lock (which is impossible if the thief takes it with them) and provide original receipts for the lock and the bike. You also must have registered the bike and lock within ten days of the lock’s purchase. Finally, you have to file a report with the police department within three days, and reports to your insurance company and Kryptonite within a week. The insurance policy seems to be more trouble than it is worth. While it might not be the best lightweight bike lock, it makes up for it with its durability. The biggest advantage of this contender for best bike lock over several others on our list is its flexibility. Unlike U-lock style locks that may have difficulty attaching to some areas, this bike lock can be used almost anywhere. It combines the sturdiness of a U-Lock with the convenience of a chain lock, without sacrificing the safety of your bike. The lock itself is pick-resistant. It also rotates, which makes it very easy to insert the key. The coiled spring that comes with this is covered in vinyl, so it does not scratch your bike. It is resistant to sawing, cutting, and more. Additionally, it does not have a coiled spring. Unlike many other chain-type locks, it can be stored either wound up or straight. The OnGuard company also added a safeguard to the Rottweiler- the key cannot be removed until it is properly locked. This prevents you from walking away without your bike lock being properly fastened. The final advantage is that it comes with five separate keys. If you do manage to lose all these copies, however, you can order more if you registered your lock with the company. There is one major disadvantage to choosing this particular lock. Instead of being made of stainless steel, it is made using hardened steel, which is susceptible to rust over time. As long as you keep it well-greased the lock should continue to work with a little rust, but you may want to consider this factor very carefully if you live in a damp environment. 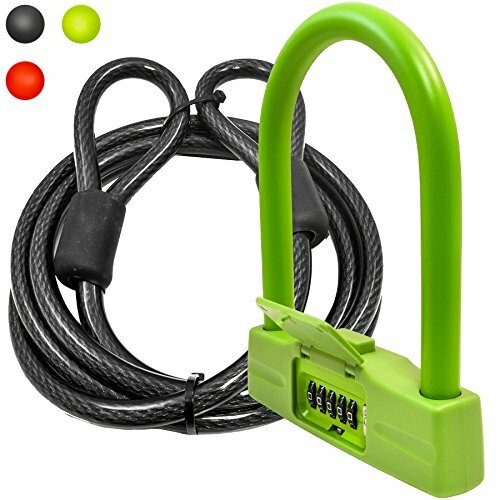 This model combines a durable U-Lock with a combination lock and a sturdy cable. For its price, it is a great choice. This lock is one of the best combination bike locks. It is designed to be very sturdy and offers all the safety of some of the top key locks out there- without the risk of losing your keys. This is a huge advantage for some people. As an added benefit, you can choose your own combination from 10,000 different combinations. The design of this best bike lock is great. First, it comes with a U-lock and a cable. This gives you the option of winding the cable through your tires and your frame. This particular model has a cable so long that it can even be used to lock two bikes at once. The chain itself, as well as the U-lock, are both resistant to cutting and prying. Some of the extra features include a mount for easy transportation of the bike lock. Additionally, the entire cable is coated with a rubber exterior. This prevents scratching and other damage to the paint of your bicycle. The biggest disadvantage to note is that the number dials on the combination lock can become hard to move over time. You can remedy this with a little grease. Not only will it make the lock move smoother, it will prevent water from getting into the lock. This is a great option for someone who wants a longer lock, without the hassle of carrying around a chain. 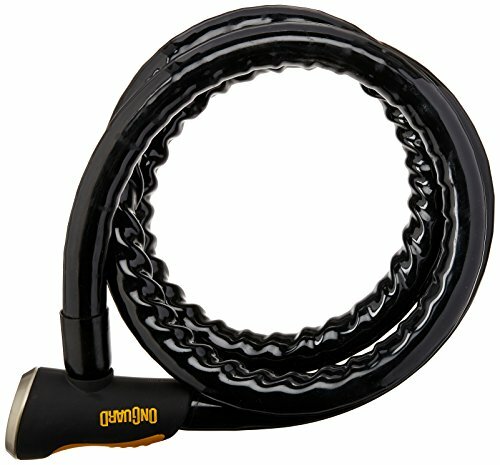 This is another unique lock on our list of best bike locks. This one offers all of the convenience of a cable lock, in a much more sturdy and convenient package. It folds up for easy transport using a system of links. The links are very resistant to breaking. This also makes the list as one of the best combination bike locks. This is great if you lose or forget your keys frequently! You can choose your own combination, however, the instructions are not included. You also need a tool to do this, which does not come with the purchase of the lock. What the lock does come with are a carrying case and mount. This cable easily folds up to fit inside the carrying case. You can attach it to the mount, or it fits very nicely inside of a water bottle holder. The design of the lock is also great. For the first week or so, you may have difficulty using it. After you adjust, however, you will be able to lock your bike up in seconds. This lock is long enough so that you avoid the problems of not being able to fasten it to certain bike racks or poles. Its length is enough for the wheel and frame, but you may need to use a second lock if you want to fasten it through both wheels. A second lock is made possible by the fact that this best bike lock is interlinkable. While this is the most expensive bike lock on our list, it is a great choice for those who want flexibility with their lock. It offers all the convenience of a cable lock, with neater folding capabilities and more sturdy features. So What is the Best Bike Lock? After considering all of the great options for bike locks on this list, the best bike lock for the price is definitely Kryptonite’s Fuhgettaboudit bike lock. Not only does it top our list as the best lightweight bike lock (it is at least half the weight of all of the others on the list), it is the best bike lock for NYC. This makes it the strongest, most durable, and the best deterrent from theft. With its high-performance steel construction, U-Style lock that is resistant to force and cutting attacks, and double deadbolt lock, it is definitely something that a thief has to be extremely determined to get through. Its incredible price, high quality, and sturdiness makes it the best bike locks of 2015- but also a contender for the best bike locks for years to come. Remember- the best deterrent for a bicycle thief is a well-chosen bike lock. Your bike lock should make you feel confident enough to lock your bike up anywhere- whether it is outside in NYC or on your porch overnight. Before choosing a bike lock, be sure that it can really perform as well as you would hope. Cheaper bike locks may easily be cut off by someone who is desperate enough to get their hands on your bike, but the best bike locks will make you feel confident knowing that nobody can steal your bicycle from anywhere.